This smoked ham recipe has a mustard and horseradish glaze that adds a dimension of flavor that is to die for. The key to this recipe is really the smoky flavor mixed with the spiciness of your horseradish, spicy mustard, and cayenne pepper. These elements mixed with the sweet taste infused from the sliced pineapple and pineapple juice has a delicious balance of flavors that is perfect for Thanksgiving, Christmas, or just a Sunday family dinner. Also, purchasing a precooked ham makes this recipe much quicker and easier than worrying about when other pork recipes are done. Just simply rub the seasoning on, put it on the smoker for a few hours and enjoy! 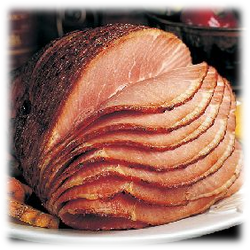 This smoked ham recipe begins by lighting your smoker for indirect grilling and soaking your wood chips in water. Put your wood chips in a smoker box or aluminum foil pouch right before your put your ham on the smoker. Season the ham by mixing the horseradish, brown sugar, cayenne, spicy mustard, salt, and black pepper together and rubbing it all over the outside of the ham. Next, lay your sliced pineapple all over the ham arranging them so they are laying on the side as well as the top of the ham. Pour your pineapple juice in the bottom of the aluminum foil tray. This pineapple juice will add moisture to the ham during the smoking and also add a sweet flavor that goes great with the spicy ingredients of the seasonings. Place your foil tray on the smoker and smoke the ham at 225-250 degrees Fahrenheit. Smoke your ham for about 3 hours. Since you are cooking a precooked ham, you don't need to worry about checking the internal temperature or making sure it is fully cooked. Smoking your ham will take about 3 hours. This will allow enough time to give your ham a smoky flavor and cook in the seasoning to give a nice spicy crust glaze on the outside of the ham.